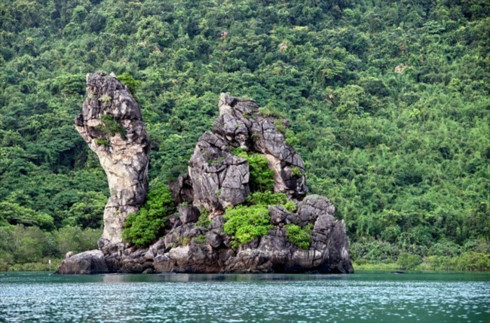 Bai Tu Long National Park in the northern province of Quang Ninh has been named the 38th ASEAN Heritage Park. The title awarding ceremony was held by the Ministry of Natural Resources and Environment, the United Nations Development Programme (UNDP) and the local People’s Committee in Ha Long city on May 19, coinciding with a ceremony to mark International Day for Biological Diversity (May 22) and International Migratory Bird Day (May 10). ASEAN Heritage Park programme is an initiative of the ASEAN Working Group on Nature Conservation and Biodiversity implemented since 2002. Bai Tu Long National Park meets all criteria to become an ASEAN Heritage Park, including ecological integrity, representativeness, nature, preservation, management and conservation plan and legality. bai tu long national park becomes asean’s 38th heritage park hinh 0 Earlier, the title was bestowed on five national parks in Vietnam, including Ba Be, Hoang Lien, Kon Ka Kinh, Chu Mom Ray and U Minh Thuong. Over the past years, Bai Tu Long National Park has saved, taken care of and released to the nature over 200 forest animals and five sea turtles. It has also joined hands with international organisations to implement such projects as sea turtle preservation, enhancing management capacity and biodiversity conservation, and supporting eco-tourism development and environmental education. At the event, Deputy Minister of Natural Resources and Environment Nguyen Linh Ngoc stressed that the Government has paid special attention to fleshing out preservation work to safeguard biodiversity. A biodiversity action plan has been carried out in 43 cities and provinces while provincial biodiversity conservation planning has been mapped out in 16 localities, he said. In a bid to promote biodiversity preservation, Ngoc asked the public, especially young people, to raise awareness of the role of biodiversity and sustainable tourism in socio-economic development. The official also called for the promotion of communication work to implement legal regulations on biodiversity conservation and campaigns to protect the environment. Quang Ninh is now home to 4,350 species of fauna and flora, including 154 species listed in Vietnam’s Red Book. However, local ecological systems are being degraded and damaged by human economic activities. Tigers, bears and horses vanished from the province while coral reefs have been spoilt. On the occasion, a conference on biodiversity and sustainable tourism took place, discussing measures to boost sustainable tourism development in combination with biodiversity preservation Bai Tu Long National Park and Ha Long Bay.